Rural commuters drive much more than their fair share of miles. Could a few small changes have a big impact? 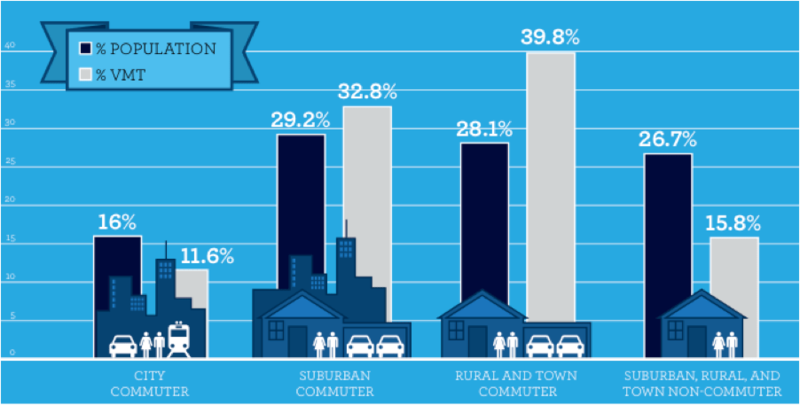 Image: ##http://www.nrdc.org/transportation/driving-commuter-choices.asp##NRDC## via the 2009 National Household Travel Survey. Still, Megan wasn’t ready to lay down her car keys and embrace the transit commuter lifestyle altogether. She wanted to start slow, a couple days a week. That’s great, Perks said: Even a couple days a week can save a lot of money, not to mention greenhouse gas emissions. But how much would she save? It’s a good thing Perks works for the Natural Resources Defense Council, which allowed him to research the question. 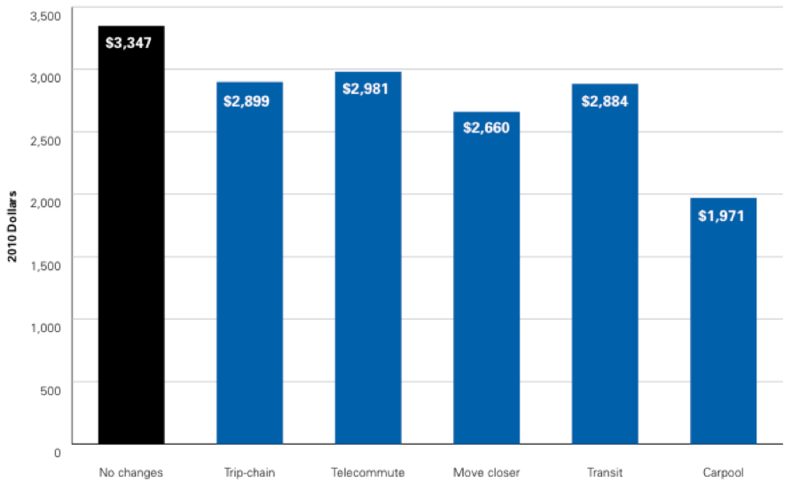 His findings, released this week in a study called “Driving Commuter Choice in America,” attempt to quantify how much people can save by making modest changes in their commuting habits. The report is at times is more confusing than enlightening. First, Perks and his co-author, Craig Raborn, categorize commuters by where they live: urban, rural, and suburban. They also looked at non-urban non-commuters — those who don’t travel to a job every day. Then they looked at a few different ideas for reducing driving — carpooling, taking transit, trip-chaining, telecommuting, and moving closer to work. And they attempted to arrive at a dollar figure for how much any of those four types of commuters would save if they supplanted various amounts of driving with various alternatives. “We originally, in doing this project, wanted to build out some sort of a calculator to mix and match whatever their preferences were,” Perks told Streetsblog. “Somebody could say, ‘I’m going to work from home once a week, and I’m going to take transit twice a week, and I’m going to drive the rest of the time.” He’s still hoping they’ll have funding to do something like that in the future, but for now they were stuck with more static estimates. Through these static estimates, the report authors arrived at the somewhat surprising conclusion that carpooling would save the most money of any of the options — but it’s less surprising when you realize they’re comparing carpooling every day with taking transit just four days a month. They estimate you can save up to $1,800 a year by carpooling and just $450 to $600 by taking transit. NRDC looks for middle ground by giving people more achievable goals — just take transit a few days a month, or just move 25 percent closer to work. The problem is, not all of these actions are scalable. Transit service simply isn’t available everywhere. Where it is readily available, people use it — NRDC estimates that 23 percent of city folks commute by transit at least four days (eight trips) a month, but that number plummets to 6 percent of suburbanites and just 2 percent of rural folks. As Brookings reported last year, 70 percent of metro-area jobs are inaccessible by transit to the typical resident of that region. So while taking transit just four days a week seems like a good compromise, it’s still easier said than done if you and your job are a complete transit mismatch. Moving closer to work is another thing that isn’t always easily scalable, but it provides far more benefits than even NRDC quantifies. Moving closer to employment centers means you may also be moving closer to a walkable community with destinations that are closer together and which have more viable transportation options like biking and walking. So you won’t just drive 25 percent less on your way to work, you might find that you can now shift your commute to different mode, saving thousands of dollars a year. But these things aren’t always possible at the drop of a hat. Location efficiency is good to keep in mind during times of transition, but moving, even just a mile away, is an extraordinarily heavy lift and is not as easy an action to take as, for example, carpooling. If you have a few co-workers who live in your neighborhood and work a similar schedule, you’ve got yourself a ride-share. HOV lanes are appearing all over the country — but carpool rates are declining. A few years ago, Census data revealed that fewer than 12 percent of Americans were carpooling to work — about half as many as in 1980. Even in the DC area, where slugging has revolutionized “your father’s carpool,” as Perks puts it, carpooling is at less than 10 percent. The NRDC report is conservative in estimating the savings of mode shift. It puts the cost of driving at $2,180 for city commuters, $3,347 for suburbanites and $4,272 for people in rural areas. It never assumes that a person can eliminate ownership and maintenance costs by getting rid of a car altogether — which can mean savings of $10,000 or more a year. This is also a weakness of carpooling over transit, since the other members of your carpool might not be so thrilled if you get rid of your car. “We’re being realistic here in that we’re not advocating that people give up their car or stop driving,” Perks said. “Again, I’ll use my friend as the example. At no point in my conversation with her did I say, ‘Wow, you’re really stupid for taking a car.’” Still, it’s not unheard of for a daily transit commuter to sell a car that’s just gathering dust in the garage. Considering the robust endorsement of carpooling in the report, advocates couldn’t help noticing that NRDC doesn’t make any policy recommendations related to carpooling or ridesharing. The organization suggests investing more in public transportation at all levels, that metro transportation and growth plans work toward walkable and transit-oriented development, and that the transit tax benefit be used to incentivize public transportation over driving. But policy isn’t really the aim of the report — it’s to nudge individuals to make the little changes, at modest levels, that could bring about small improvements. After all, Perks and Raborn find that if even 5 percent of people switched to daily carpooling, they would eliminate 50 billion miles of driving, saving $7 billion and 23.4 million tons of carbon dioxide a year. In Arlington County, we have invested in helping commuters become aware of their many diverse options. Through this work, we’ve documented 45,000 car trips shifted each work day into other forms of transportation. So not only can the initiatives noted in the NRDC report save people money and help clear the air, they can also make the streets less congested and improve individual and business productivity. Beside policy recommendations, there’s also a need for convenient, efficient apps for helping people share rides.